A Katrina survivor has the perfect explanation for Obama’s perfect response to Louisiana flooding. 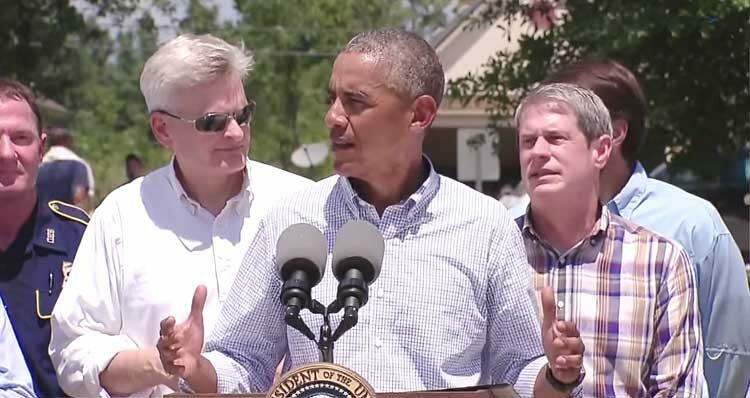 President Obama continues to be the subject of harsh criticism from conservatives regarding his response to the recent flooding that has devastated Louisiana. The flood has been called the worst US natural disaster since Hurricane Sandy in 2012, and as of August 22, a total of 13 deaths have resulted from the flooding. Obama toured “flood-ravaged Baton Rouge” on Tuesday, telling reporters “We are heartbroken by the loss of life,” referring to the 13 people who were killed in the flooding. White House Press Secretary Josh Earnest defended the timing of the president’s visit, telling reports that “the President is used to people trying to score political points even in situations where they shouldn’t. Earnest also noted that $120 million in federal aid has already been approved, and flood-impacted residents are already receiving payouts. As The White House reports, President Obama has declared 20 parishes a major disaster from severe storms and flooding – a declaration that makes federal funding available to affected people in Acadia, Ascension, Avoyelles, East Baton Rouge, East Feliciana, Evangeline, Iberia, Iberville, Jefferson Davis, Lafayette, Livingston, Pointe Coupee, St. Helena, St. Landry, St. Martin, St. Tammany, Tangipahoa, Vermilion, Washington, and West Feliciana. In addition to the 20 parishes, FEMA is conducting a joint Federal and state damage assessment in Assumption and St. Charles. Housing remains a top priority, and FEMA and Louisiana state officials have convened a Strategic Housing Task Force to explore immediate temporary housing solutions for displaced survivors. The Department of Housing and Urban Development announced it will speed federal disaster assistance to Louisiana and provide support to homeowners and low-income renters forced from their homes due to severe storms and flooding. At FEMA’s request, HUD will coordinate the federal government’s Housing Recovery Support Function to provide resources and assistance in the rehabilitation and reconstruction of destroyed and damaged housing and development of new permanent housing, where needed. In support of this mission, HUD has deployed a team of disaster recovery experts who arrived in Louisiana on Monday, August 22. Right now, FEMA, through its regional office in Denton, Texas, is highly engaged in response efforts in Louisiana. Meanwhile, Elizabeth Jane Welch, a survivor of 2005’s Hurricane Katrina, posted the perfect response to criticism surrounding President Obama’s response to the current crisis. I stood on the roof of Methodist Hospital 11 years ago, waiting for helicopters to land to rescue myself and my coworkers after a week of hell after Hurricane Katrina. I watched as the Coast Guard were basket lifting people out of the surrounding areas in New Orleans East. Suddenly, all of that stopped. We were told that the New Orleans airspace was now closed to ALL FLYING MACHINES because then President Bush was in the air, surveying damage to New Orleans. That meant no more ongoing rescues, no drops of food and water, etc. There is a REASON our Governor Edwards did NOT want Obama (or any other Washington politician) to visit flood affected areas. You do realize that EVERY police officer and public official would have to drop relief efforts to make sure the President was protected. Roads would have to be shut down and resources halted, for a visit. I remember how much I wanted to get off of that God-forsaken roof 11 years ago and couldn’t. I would NOT want to be a flood victim and have to be put “on hold” for a politician or even our President to visit. What he can see first hand, he can see via satellite or any other way. Welch went on to add a comment nine minutes later expanding on her criticism of Trump. “Let’s stop praising Trump for visiting before Obama or etc. He strictly IGNORED the advice of our Governor, who has firsthand accounts of what is happening here, to not visit. We need MONEY AND RESOURCES, FFS, not more arguments and divisiveness,” she wrote.